Here is the procedure to restore the pads printing Epson Stylus TX130, follow all the steps like as described. This printer is a high yield and good quality printing, scans and copies what becomes it in a multifunction printer it has a good appearance to place it both our home and office. It is an economical printer and the main reason is that it uses separate Epson ink cartridges, these are the only kind of cartridge that allows us to replace only the cartridge that runs out. 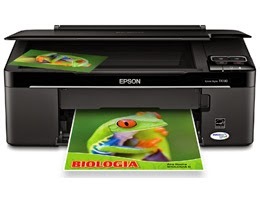 It has a 48-bit scanner up to 1200 dpi, print up to 28 pages per minute in black and about 15 pages per minute in color, you can print paper sizes Letter, Occupation (21,6 x 35,6cm), A4, B5, A5, A6, report, executive, statement, user-defined: (8.9 to 21.6 cm) x (8.9 to 111,7cm) Envelopes: No. 10, DL, C6 and supports with Windows® 7, Windows Vista®, Windows XP, Windows XP Professional x64 Mac OS® X 10.4.11, 10.5.8 operating systems - 10.6.x. Something that we must have a close eye on when doing a reset of this and any other printer is that we cannot have any other printer connected, necessarily it has to be running up while the computer is connected it means both the computer and the printer have to be running perfectly. After we have the decompressed file we double click on the program file that has the following image. 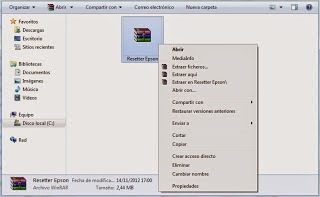 It is necessary to run this file and we can do it by double clicking on the right mouse botton and running the file. A message appears saying that this program is free just click on "accept". In Model Name will appear the name of reset we are trying to install, and then the "Destination" we leave it as shown and in the port we leave the default option in this case is "Auto Selection". See the previous image, if you have a question make a comment. In this step we have to be very careful, if we select any other option it can be fatal to our printer, even we can delete the configuration of our printer forever, it is recommended to only select the option that we will tell you. The option that we have to select is called Waste Ink Pad Counter and we click on OK to continue. This will restore the printer to tell there is no ink any longer even if this is done we have to know that the residues are full, though perhaps the printer come to think this by the number of pages that have been printed with it, but in reality can cause problems over time. It is important for you to download the printer drivers for Windows XP / Vista / 7, get free manual for this printer (html) with this we can read printer factory specifications.